Credit: © Jan Tønnesen & Valentin Nägerl. Microscopy is a basic tool in research into the biology of any organism given that the elements studied, the cells, are of microscopic and frequently nanoscopic size. 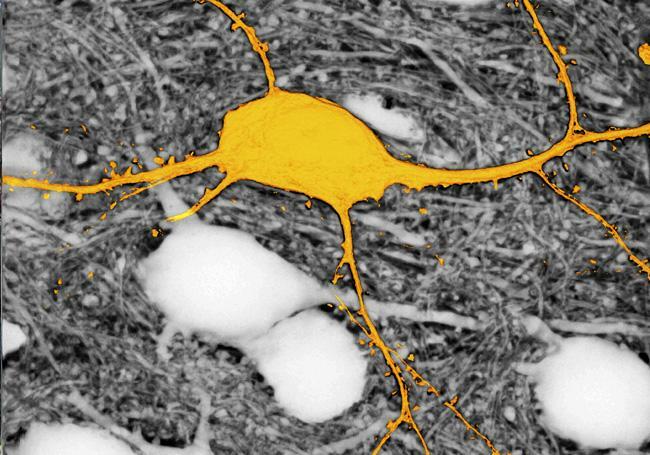 Until now, existing microscopy methods to explore living brain tissue have been limited to imaging previously labelled cells only. Yet, owing to technical limitations, not all the cells in a specific region of the brain can be labelled simultaneously; this has restricted the way we see and therefore understand how brain cells, which are highly interconnected, are organised and interact with each other. Dr Jan Tønnesen (Sweden, 1977), researcher in the Ramón y Cajal Programme at the UPV/EHU's Department of Neurosciences, and who works at the ACHUCARRO centre (Achucarro Basque Center for Neuroscience) located in the Basque town of Leioa, is one of the authors of a piece of work just published by the prestigious scientific journal CELL. The article describes a new microscopy technique known as SUSHI designed to improve the imaging of cells in living brain tissue. The new SUSHI (Super-resolution Shadow Imaging) technique allows the tiny space full of liquid surrounding brain cells to be labelled in one sweep, thus obviating the need to individually label all the cells that one is intending to analyse. Given that this "label" also remains outside the cells, a kind of negative image akin to the film used in old cameras is produced. So the negative image contains the same information about the brain cells as its corresponding positive image, but thanks to the fact that the labelling procedure is more straightforward, it is much easier to obtain this image and all the information contained in it. According to Dr Tønnesen "The SUSHI technique is revolutionary because it allows us to simultaneously image all the brain cells in a specific region of living brain tissue. In the past we used to come across blank spaces in the microscopy images, because we were unable to label all the cells at the same time. This fact was a big constraint for us. From now on, this technique will enable us to see all the cells in the area of study that we put under the microscope lens as well as all their interactions, and that will allow us to advance our knowledge of brain functions in a healthy organ and in a diseased one". This advance is the result of a cross-border, interdisciplinary project developed between the research group led by Professor Valentin Nägerl of the University of Bordeaux (France) and Dr Jan Tønnesen, who has joined the UPV/EHU's Department of Neurosciences and who works at the ACHUCARRO facilities inside the university's Science Park in Leioa.